My Grandma June made the best family dinners. You could always count on her to put out a good spread of food. Two of her favourites were meat and potatoes. She said that was what her husband, Clarence, would always request. He was a beef farmer so you can guess what the meat typically was. As for the potatoes, his favourite way to eat them was mashed with butter. Good old-fashioned comfort food is what she would say. Whenever I make meat and potatoes for my family, I always think of her. Grandma’s mashed potatoes were great, but very traditional. Don’t get me wrong – I loved her cooking. Sometimes, it’s fun to change things up a little. You can still keep the “bones” of a recipe, but add in a little zip to make it more interesting. Almond Breeze had a mashed potato recipe that caught my eye. I’ve cooked both sweet and savoury recipes with Almond Breeze before with great results. This would be my first time using it in a mashed potato recipe. 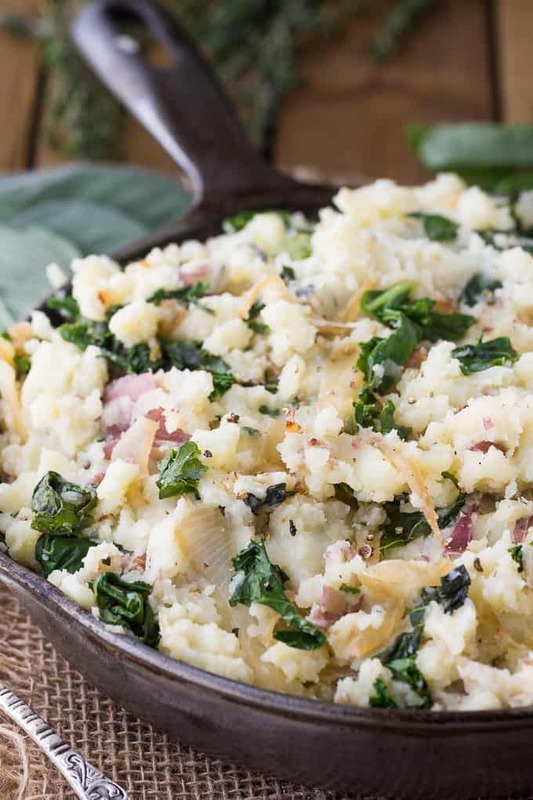 How would their recipe for Olive Oil Mashed Potatoes with Kale & Herbs compare to the classic? I was about to find out. 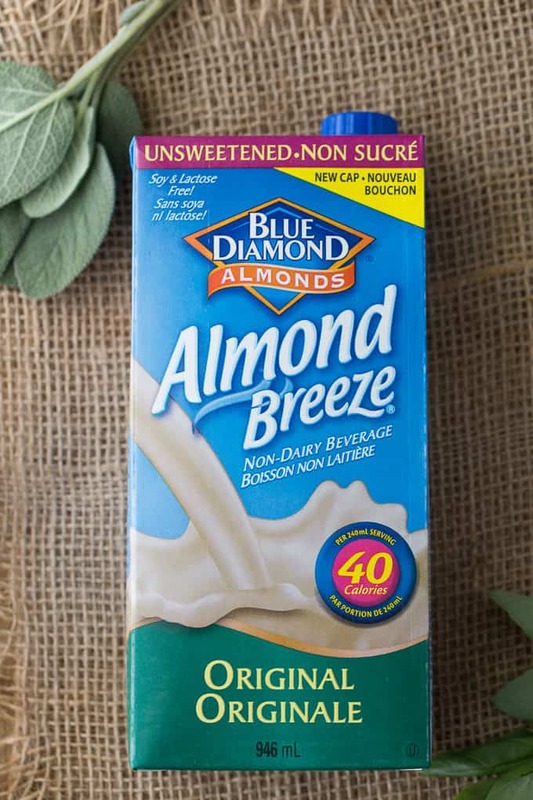 The first thing you need to do is pick up some Almond Breeze Original Unsweetened. They have sweet varieties too, but I like using the unsweetened versions in savoury recipes. Use it the same way you would milk. You can substitute it cup for cup which makes it easy to switch out ingredients when you are cooking. It’s dairy-free, lactose-free and gluten-free so if you are making a recipe for someone with food intolerances, it is a fabulous alternative. It’s easy to update old and new recipes with Almond Breeze and add a lovely bit of almond-y flavour to your dish. The first step is to cook the potatoes. I liked that I didn’t have to peel them. Leaving the skin on adds an additional layer of flavour and gives the dish a more rustic feel. Plus, the recipe directs you to cook them in the microwave – something I’ve never done before. I love easy! While the potatoes are cooking, grab a skillet and caramelize the onions in olive oil. I love cooked onions – they have such a lovely, sweet flavour. I had to stop myself from grabbing some from the pan to taste test over and over. It takes a good 15 minutes to cook the onions until they are soft and browned. Add in some garlic and fresh kale and this step is complete once the kale is wilted. By the time your onions are cooked, your potatoes should be done and ready for the next step. Mash them up. This step is a bit therapeutic. Then, mix in Almond Breeze and fresh herbs. I used basil, thyme and sage, but they also suggest rosemary or marjoram. I think whatever fresh herbs you can find should work ok.
Almond Breeze makes the potatoes creamy and easy to stir. Without it, you’ll have lumpy potatoes so don’t skip this important step! Lastly, you’ll mix your onion and kale mixture with the mashed potatoes and serve. My kitchen smelled amazing while I was cooking this recipe. My whole family was salivating before dinner and couldn’t wait to try it. Pair it with some roast beef and you have a hearty meal that would make my grandma proud. I know she would have loved this recipe. The flavours really pop. I especially loved the creaminess the Almond Breeze adds and the savoury flavour of the sweet onions and fresh herbs. Even John who isn’t a fan of kale loved this recipe. I can easily see myself making it again. If you’re in a dinner rut and want a recipe that is a bit “outside the box”, this is perfect for you to try. It makes for a beautiful presentation and hearty side dish your family will love. You might also like these Irish Potatoes or Mashed Potato Casserole. What are your favourite ingredients to add to your mashed potatoes? A twist on a comfort food classic side dish! Add potatoes and chicken broth in a large microwave-safe bowl and cover. Microwave on high for 15 minutes or until soft when pierced with a knife. Mash. Stir in Almond Breeze, herbs, salt and pepper. While the potatoes are cooking, heat olive oil in a large skillet over medium heat. Add onions and cook for 15 minutes, stirring frequently. Add in garlic and stir. Cook 5 more minutes. Add kale to skillet and cook for 2 minutes until wilted, stirring frequently. Add kale mixture to potatoes and stir to combine. Transfer to a serving bowl and serve hot. I used fresh basil, sage and thyme. Would have to leave the Kale out in order to get my family to eat them but it sounds like a new way to try doing our potatoes! That sounds both delicious and healthy. Gotta try it! 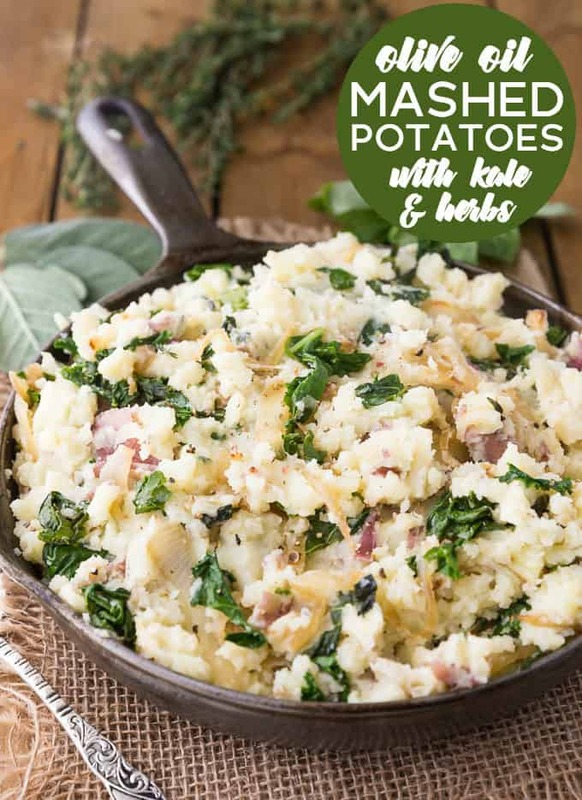 I’ve never tried kale in my mashed potatoes before, but these look so good! Love the photos. I’m not a fan of kale but I do eat it once a year as it’s part of our traditional Christmas Eve meals. For this I’d chop it really tiny so that I don’t notice it LOL. I usually just add butter, a bit of milk and some garlic, sometimes I add cheese. I have been really lovin’ potatoes lately! I’ve never made potatoes like this, oh, I want to try it! They look so delicious, I have to try them! I love mashed potatoes. These look so delicious. This looks delicious. I have never tried kale so this would be a new experience for me. 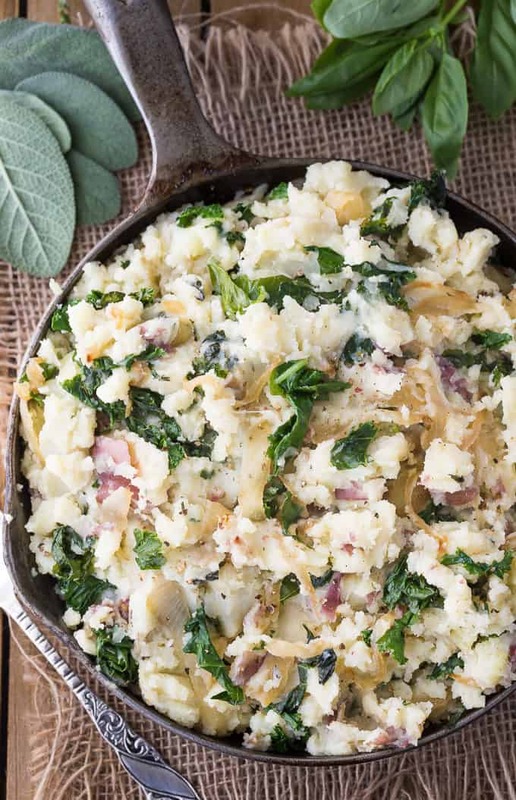 I want to make the Olive Oil Mashed Potatoes with Kale & Herbs! These potatoes look delicious and a good way to get my kale! That looks so fluffy and good with the kale and herbs. I’ve been trying to add more kale into our diet into salads and stir frys. 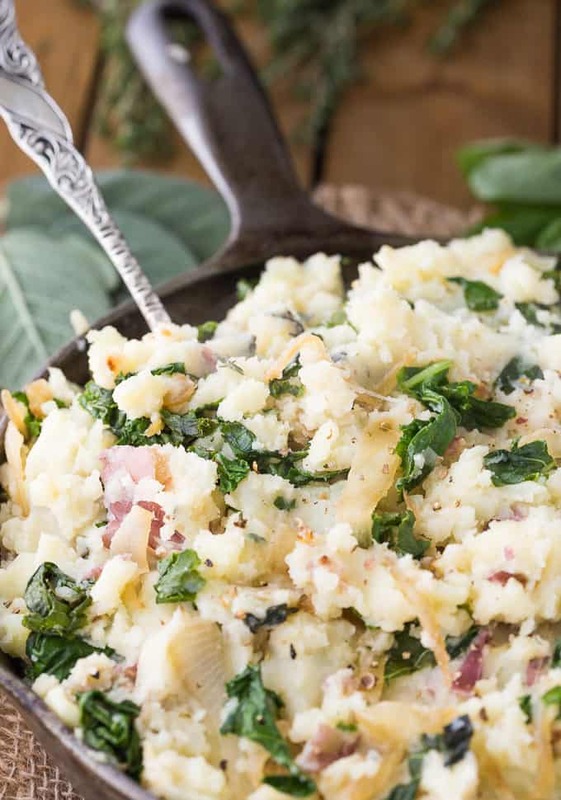 I’ve never tried adding kale to my mashed potatoes before,but it sounds interesting ! OMG this looks amazing and the bonus is that its healthier with almond milk, kale and other veggies! I will have to try these as a I suffer from allergies… My favourite ingredient for mashed potatoes is garlic and green onions. I know this is weird, but I love adding lemon to my garlic mashed potatoes. I can hardly wait to try this recipe. I love mashed potatoes but my Italian husband, not so much. Using olive oil and Italian spices with the kale will really win him over, I’m sure. These sound good! Kale is a nice way to bring some freshness into mashed potatoes. Great flavors in this. Good for you too. I’m always looking for new ways to do potatoes. Thanks for the recipe. I hope this will get my kids to eat kale finally! 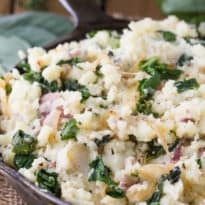 I love the color that the kale and herbs added to these mashed potatoes! Looks delicious, I can’t wait to try it! The potatoes look really good. The idea of cooking them in the microwave is kind of weird, but it looks like they come out just as soft as if you had boiled them on the stove. I love garlic in my mashed potatoes but I never thought of caramelizing some onions to go in them. These mashed potatoes look really good. I love the idea of adding kale because it makes you feel less guilty about eating mashed potatoes. I would never have thought of adding almond milk. Looking forward to giving it a try. Thanks for the recipe. What a great way to use kale. It looks absolutely delicious. This look delicious! I love adding kale to simple dishes. It packs so much flavor! Thanks for the great recipe idea! Those look great. We’re both eating very low-carb but I think I can pull the same flavours into riced cauliflower! This looks great! I would probably sub in vegetable stock, but I love the twist on an old classic! 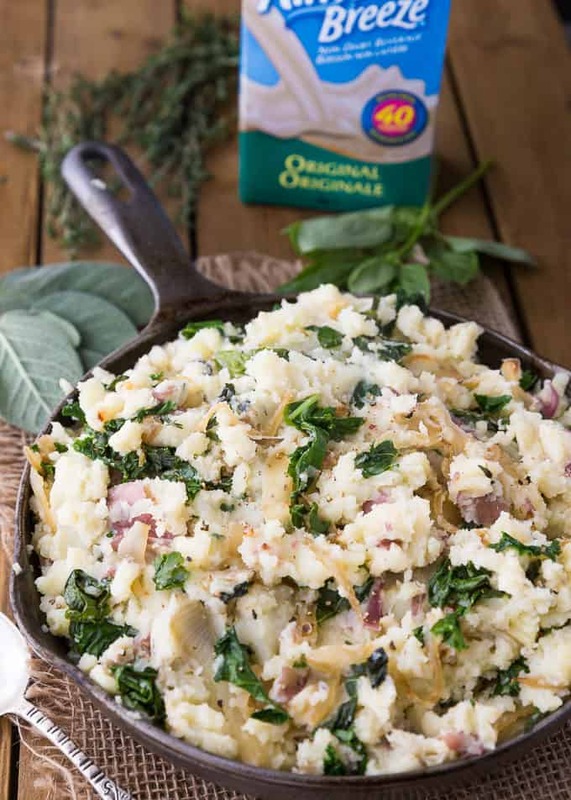 Mashed potatoes and Kale is one of our long time family favorites, but we never tried it with olive oil. Sounds yum. My hubby is firmly against greens but I might just try this dish on him because I think I could pull it off. Sounds delicious, thanks! Delicious Mashed Potatoes! Your post is awesome and thanks so much for sharing it with us at Full Plate Thursday. Hope you are having a great day and come back to see us real soon! Pingback: Wine'd Down Wednesday 194 | Dizzy Busy and Hungry! I love making potatoe salad with olive oil, it gives it a rich robust flavor. Very healthy and tasty. I love mashed potatoes. I would really enjoy this recipe! I love that it has the kale added and especially the fresh herbs. This looks great! I like adding roasted garlic, chives, and sour cream.